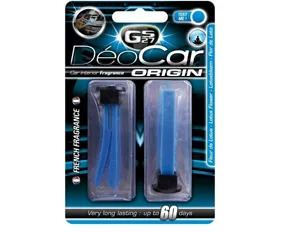 GS27’s DéoCar Origin is a sophisticated, discreet way to fragrance a vehicle. It is placed directly in the air vents and diffuses the fragrance evenly through the air conditioning system. Because the innovative air freshener is made of soft touch supple plastic, it will not leave any scratches, color or marks on dashboards or vents. Once placed in the vent, the subtle fragrance will last up to 60 days and keep the vehicle smelling like new. DéoCar Origin comes in several fragrance options so motorists can find the perfect scent for their vehicle.